This Tales classical music weekend will be a special edition as it is the weekend preceding Christmas Day on Tuesday, Dec. 25, celebrated by Christians around the world. When I thought of what classical music would be appropriate for this weekend, one of my favorite pieces Ave Maria, immediately came to mind. I knew this song had religious significance and was about the mother of Jesus, but I wasn't sure where the Ave Maria song originated. 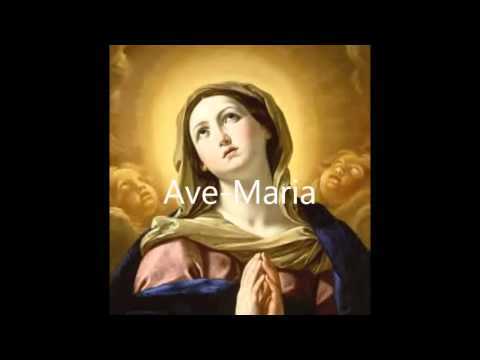 I found out that Ave Maria actually means "Hail Mary" and it is a traditional Catholic prayer asking for the "intercession of Jesus mother Mary". Some Protestant denominations also make use of some form of the "Hail Mary" prayer. Many of the Baroque and classical composers were very religious [like J.S. Bach] and their faith played an important part in their compositions. Because of that there are many versions of the prayer Ave Maria that have been set to music by the masters. I believe the two most popular versions of Ave Maria are: 1. the version by the French composer Charles Gounod, who added words and a dominant melody to the quintessential Baroque composer Johann Sebastian Bach's first prelude from his set of keyboard pieces called the "Well Tempered Clavier" [that you can hear in the background]. That is why this version is called the Bach/Gounod Ave Maria; and 2. the more well known and beloved version of Ave Maria by the classical composer Franz Schubert. Franz Schubert's version is probably played more than any other and this version is my favorite. The moving Schubert version of Ave Maria is one of the most beautiful songs ever composed, in my opinion. Update: Thanks to my friend from New Hampshire, @bedfordguy , for informing me of another very moving-beautiful version of Ave Maria from Franz Biebl, a 20th century German composer of mostly choral ensemble compositions. Also, I have learned of this great version of Ave Maria from reading of this recommendation by the senior editor of National Review and music critic for the New Criterion, @JayNordlinger . Please turn up the volume and enjoy these versions of the moving Hail Mary or "Ave Maria". First the Bach/Gounod version that is sung by Soprano Anna Moffo; then Franz Schubert's Ave Maria sung by American Soprano Barbara Bonney; Schubert's Ave Maria played on solo violin by the virtuoso violinist, Joshua Bell; and finally this moving version of Franz Biebl's "Ave Maria" sung by Chanticleer and the U.S. Naval Academy Men's Glee Club. On this Tales' classical music weekend preceding Christmas' special edition, I wish a very Merry Christmas to all! Big Mike, I just ran across a version by Franz Bible this weekend. Never heard it before. Had one play it over and over I liked it so much. Give it a try. I think you will like it. Thanks Harry I will check it out.